Bright Beginnings is now enrolling for the 2018-2019 school year. Tuesday, Wednesday and Thursday; 9 a.m.–12:30 p.m.
Children are officially enrolled on a first-come, first-served basis upon receipt of the application and non-refundable $75 registration fee. Three and four year olds must be potty-trained, and all pre-K classes must have a “Certificate of Compliance” (immunization form 121) before the child may enter school. 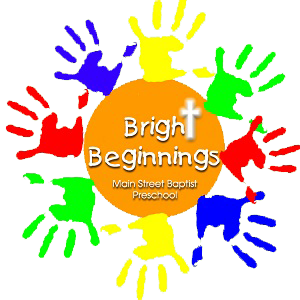 At Bright Beginnings Preschool, we are looking forward to serving you and your child! For information or to register, contact Rhea Dossett, Director, at preschool@mainstreetbaptistchurch.org.